Apple’s iPad gets its features from a combination of hardware and its software operating system (called iOS; the term is short for iPad operating system). The most current version of the operating system is iOS 12. It’s helpful to understand which features the newest iPad models and iOS 12 bring to the table. 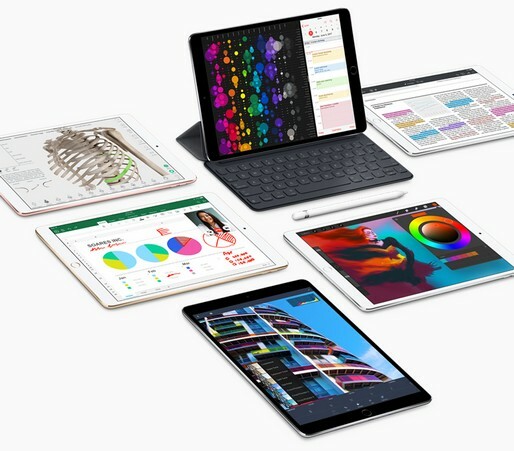 iPad: The sixth-generation iPad features a touchscreen that measures 9.7 inches diagonally and sports a super-fast 64-bit desktop-class A10 Fusion processor. iPad mini: The iPad mini 4’s screen measures 7.9 inches diagonally and uses a 64-bit A8 processor to do the behind-the-scenes work. iPad Pro: The two iPad Pro models are the fastest of the bunch. One measures 10.5 inches diagonally, and the other is 12.9 inches; they both come with blazing fast A10X Fusion processors. Dimensions of devices are typically shown in the units of measurement commonly used in a region. This means, for example, that the basic iPad is shown on Apple’s U.S. site as being 9.4 inches (240mm) high and 6.6 inches (169.5mm) wide. In metric-system countries, both dimensions are given, but the order is reversed. When it comes to screen sizes, however, the dimensions are given in inches. Screen resolution: In addition to screen size, screen resolution has evolved so that Apple’s Retina display, which supports very high-resolution graphics, now appears across the line. The name derives from the concept that individual pixels on the screen are so small that at normal viewing distance, they can’t be distinguished. Apple Pencil: Originally designed exclusively for use with iPad Pro models, the Apple Pencil now also works with the sixth-generation iPad. Apple Pencil lets you draw and write on the screen with a familiar pencil-style tool rather than with your finger. The Apple Pencil contains a battery and sophisticated processing powers that make the experience of using it very much like (and sometimes better than) traditional pencils. Third-party pencils and drawing tools exist, but Apple’s integration of Apple Pencil is remarkably smooth; the product has taken off quickly among graphic artists, illustrators, and designers. As other people have discovered its usability for marking up documents, it is becoming more and more common in business environments. Faster motion coprocessor: This coprocessor processes game features, such as the gyroscope and accelerometer. The iPad and both iPad Pro models feature the M10 coprocessor, while the iPad mini 4 sports an M8. Touch ID: This security feature is included on all newer iPad models. Sensors in the Home button allow you to train the iPad to recognize your fingerprint and grant you access with a finger press. Touch ID also allows you to use the Apple Pay feature to buy items without having to enter your payment information every time. Barometric sensor: On all three iPad models, this sensor makes it possible for your iPad to sense air pressure around you. This feature is especially cool when you’re hiking a mountain, where the weather may change as you climb. Perhaps more to the point, the changes in barometric pressure can be sensed on a smaller scale so that elevation can be sensed and measured as you move normally. 3D Touch: This feature allows for three levels of pressure on the screen. Each level can be used for different input meanings. For example, the lightest tap on an object selects it; medium pressure displays a preview (called Peek by Apple); and the heaviest pressure opens the item (called Pop). More keyboard options: The iPad Pro has a full-size onscreen keyboard. Because the screen has more space, the top of the keyboard can contain extra commands for filling in passwords and using more advanced input techniques. Smart Connector for Smart Keyboard: Additionally, you can use a Smart Connector to hook up a Smart Keyboard, which makes getting complex work done much easier. Live photos: Using the 3D Touch feature, you can press a photo on the screen to make it play like a short video. The Camera app captures 1.5 seconds on either side of the moment when you capture the photo, so anything moving in the image you photographed, such as water flowing in a stream, seems to move when you press the still photo. Performance enhancements: Apple promises that iOS 12 will increase the speed and performance of your iPad, including older models going back as far as iPad Air. From apps to keyboards to taking pictures, everything gets a speed overhaul. Siri improvements: Siri just keeps getting better. This time around Apple, Siri supports translation between over 40 language pairs. And Siri knows a lot more about food, motorsports, and other activities. Siri can help you search for forgotten passwords and can even learn your daily routines to make suggestions to you throughout the day. Notifications are better: With iOS 12, Notifications are much more easily managed and customized. They’re also grouped together based on notification type, making it simpler to see and deal with a multitude of notifications. Screen Time: Ever wondered how long you were lost browsing through social media apps, or just how much time your grandkids were spending playing games? iOS 12 introduces a fantastic new feature called Screen Time that will help you track those things and much more! Providing activity reports, shutting down apps after an allotted time, preventing some apps from being launched altogether, and setting downtime boundaries are just some of the awesome benefits that Screen Time provides to iPad users. Apple doesn’t promise that kids and grandkids will be very thrilled with Screen Time, but parents and grandparents most likely will be overjoyed. Upgrades to Photos: The Photos app receives some love in iOS 12, allowing for faster and more accurate searches of your Photos Library, better organization, suggestions for sharing, and easier imports. Several staple apps have been updated: iOS 12 provides performance enhancements and interface upgrades for News, Stocks, and Voice Memos. iBooks also receives a new name, Apple Books, and this app includes improvements in reading and discovering your favorite books. Don’t need or use all the built-in apps? If so, you can remove them from your Home screen. When you remove a built-in app from your Home screen, you aren’t deleting it — you’re hiding it. This is due to security reasons. However, the built-in apps take up very little of your iPad’s storage space, and you can easily add them back to your Home screen by searching for them in the App Store and tapping the Get button. The most obvious differences among iPad models are their thickness and weight, with the Pro being biggest, then iPad, and finally the smallest, iPad mini 4. All three models come in space gray, silver, or gold, and the iPad Pro 10.5-inch offers a fourth option, rose gold. iPad Pro 10.5-inch: Wi-Fi models come in 64GB for $649, 256GB for $799, and 512GB for $999; Wi-Fi + Cellular models come in 64GB for $779, 256GB for $929, and 512GB for $1,129. iPad Pro 12.9-inch: Wi-Fi models come in 64GB for $799, 256GB for $949, and 512GB for $1,149; Wi-Fi + Cellular models come in 64GB for $929, 256GB for $1,079, and 512GB for $1,279. iPad: Wi-Fi models come in 32GB for $329 and 128GB for $429; Wi-Fi + Cellular models come in 32GB for $459 and 128GB for $559. iPad mini 4: The Wi-Fi model comes in 128GB for $399, and the Wi-Fi + Cellular model comes in 128GB for $529. Finally, the iPad models vary in screen quality and resolution, camera quality, and so on. Logically, the bigger the iPad, the bigger the price and higher the quality.